School District Central, Zachary, and Baker school system would be unaffected. Under the legislation, each subdistrict would have its own deputy superintendent and some limited autonomy. The deputy superintendents would be appointed by the parish superintendent of schools. Each deputy superintendent shall draw school attendance zones within his subdistrict and appoint principals and other personnel. State funds would be allocated to the subdistricts based on the Minimum Foundation Program, while parish funds would be allocated on a per pupil basis. In an interview Friday, Sen. White said many details of the legislation still have to be worked out. Norman Browning, chairman of Local Schools for Local Children and leader of the movement to incorporate the proposed City of St. George, said SB484 is consistent with his groups’s efforts. “Whether the legislature acts this session or not, we are continuing full speed ahead with the effort to incorporate the City of St. George and to implement the Southeast Community School System.” He said White’s bill could provide a measure of autonomy for schools in the southeast part of the parish until a new separate school district is implemented. A. 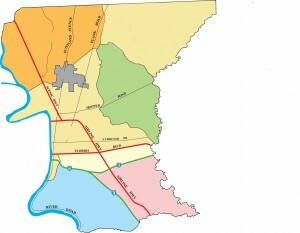 (1) The East Baton Rouge Parish School Board shall develop and implement a plan to divide the East Baton Rouge Parish School System into four subdistricts and provide for an equitable allocation of school facilities and student population to each subdistrict. (3) Each subdistrict shall have at least one magnet program at the elementary, middle school, and high school level. (1) Provide policy and administrative support for the school system, including payroll, retirement and health insurance benefits for teachers and other school and school system employees, and student transportation and school nutrition programs. (2) Receive payments from the state pursuant to the Minimum Foundation Program and allocate these funds to each school in accordance with the dollar amount generated for each individual student enrolled in the school by the Minimum Foundation Program formula, including any additional funds generated by additional weights based upon student characteristics. Locally generated revenues shall be equitably allocated to each school on a per pupil basis. The school board may retain a maximum of three percent of the total per- pupil amount established for each student enrolled in the school system to cover administrative costs and central office functions. (1) Hire and provide administrative support to a deputy superintendent for each subdistrict. (2) Supervise and coordinate all functions for which the school system is responsible. (1) Establish attendance zones for each school located within the geographic boundaries of the subdistrict for which he is responsible and exercise general supervision over these schools. (2)(a) Hire a principal for each school located within the geographic boundaries of his subdistrict. (b) The principal of any school that receives a school performance letter grade of “F” for two consecutive years shall be replaced. (1) Hire and make all employment decisions relative to teachers and other personnel employed at the school. (2) Supervise the school’s instructional program and exercise administrative responsibility for all school related activities. (3) Manage the budget for the school and oversee all school related operational functions, including transportation, food service, and facility maintenance. The principal may purchase these services from the parish school board or enter into contracts with private providers, as deemed necessary and appropriate. F. The provisions of this Section shall be implemented not later than the beginning of the 2015-2016 school year.